The highly rumored and one of the most awaited flagship of this year, the Samsung Galaxy S8, is now confirmed to be unveiled on March 29. 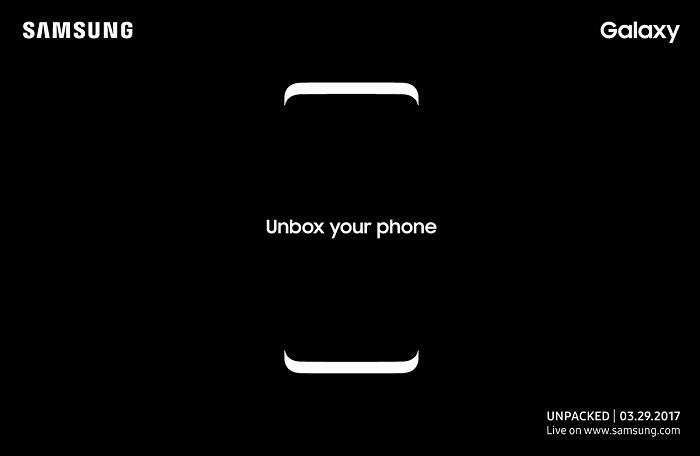 The Samsung Galaxy S8 will be unveiled on March 29 at the Unpacked 2017 event in New York as well as London. The event will start at 11:00 a.m. EST (9:30 p.m. IST) in New York and 4:00 p.m. GMT in London. It will also be live streamed on www.samsung.com/galaxy. While the invites sent by Samsung don’t mention the name of the Galaxy S8, the outline of the phone shown in the image certainly confirms that Samsung will unwrap the Galaxy S8 on March 29. Apart from that, the image also says “Unbox your phone“. Alongside the Galaxy S8, we are pretty much sure that Samsung will also unveil the Galaxy S8+ on March 29. Going by past leaks and rumors, there aren’t much differences between both these devices, except the difference in screen size and battery size. The specifications of the Galaxy S8 had leaked last week, and according to that leak, the Samsung Galaxy S8 will boast a 5.8-inch Quad HD+ Super AMOLED display and come with 4 GB RAM along with 64 GB of internal storage. The device will have 12 MP Dual Pixel camera at the back and will have an 8 MP camera on the front. It will come with IP68 dust and water-resistance and will also feature the Iris Scanner which was found on the Galaxy Note7. Also, the bundled earphones will be tuned by AKG. As far as processor is concerned, the Galaxy S8 and S8+ are expected to be powered by Snapdragon 835, however, those variants may only be restricted to the US. Other regions might have to make do with an Exynos variant. Also, while Samsung has now confirmed that it will unveil the Galaxy S8 on March 29, the company is reported to launch it globally on April 21. There’s still more than a month’s time for the unveiling but we are pretty sure that the Galaxy S8 and the S8+ will keep making rounds on the Internet in the form of leaks and rumors.